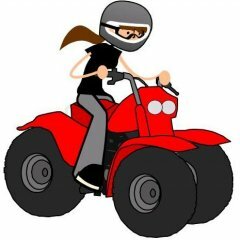 Hi Ladies, I am new to the forum and to riding. I just bought a 2002 Honda 400ex and I love it. I went out riding for the first time last Sunday and I can't wait to get back out there on Saturday. My question is do you wear your wedding/engagement rings while riding? I just recently got engaged and I never take my ring off. It fits fine under my glove and I am wondering if anyone else has lost theirs or had a bad experience wearing it while riding.